As we travel the world with Behind the Scenes travelers, we all make wonderful friends everywhere! We are welcomed into homes, studios, offices, markets, shops, and schools, and the local people show all of us generosity and goodwill that is very touching. Sometimes in getting to know the teachers and school principals, we discover a pressing need for BTSA help projects. The West African school visits can warm your heart, and break it too: classrooms are crowded beyond belief, and students often lack basics such as books and chalkboards. Sometimes students must sit on the floor or the ground because there are not enough chairs, or desks. Or there is no bathroom, as you will see below. 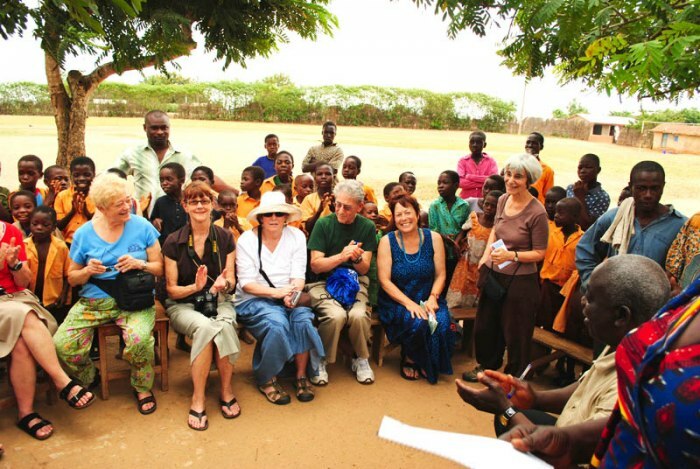 Our wonderful, generous travelers have taken up the call, and on every trip, they bring school supplies and books that the group delivers to one of three schools we have adopted in West Africa. One is in Mali, one in Ghana and the most recent in Senegal. 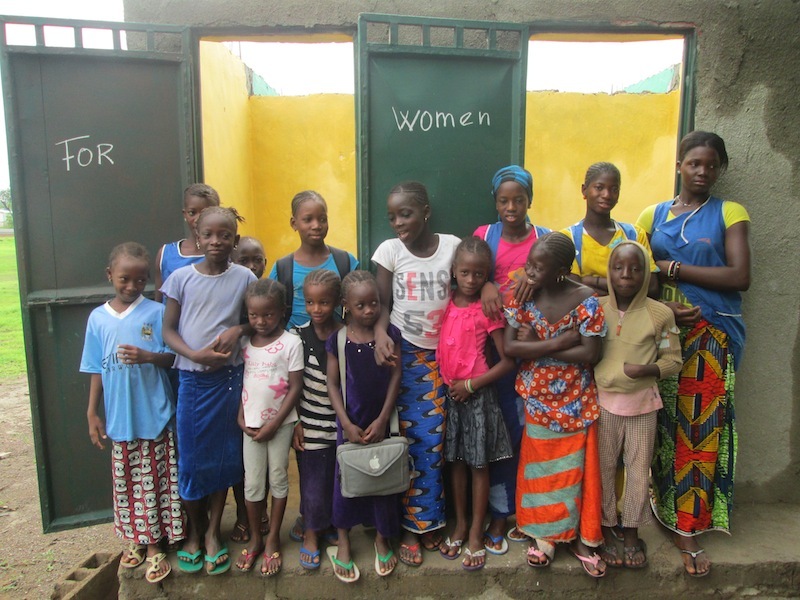 Students say thanks for the bathroom to donor Ruth A. 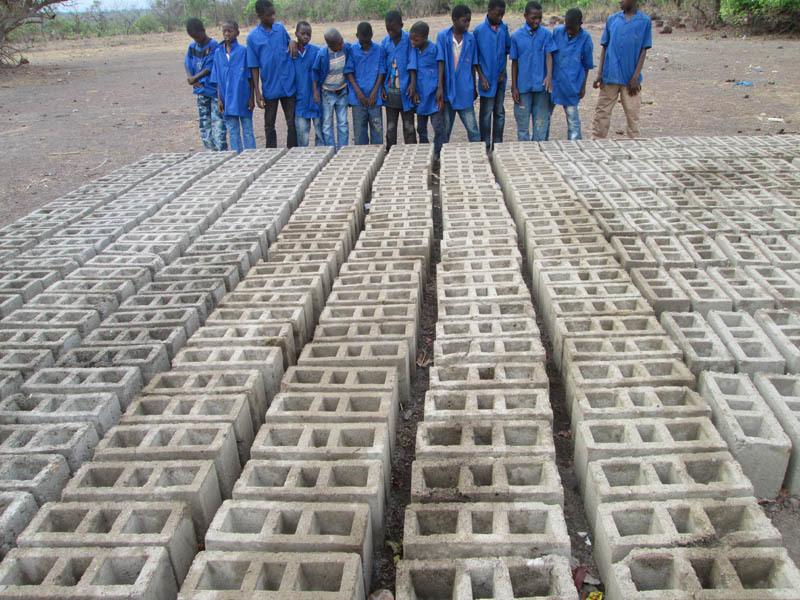 Naturally we are aware that these efforts are the proverbial ‘drop in a bucket,’ but donations have been received with heartfelt gratitude by the teachers and principals, and with joy by the students. 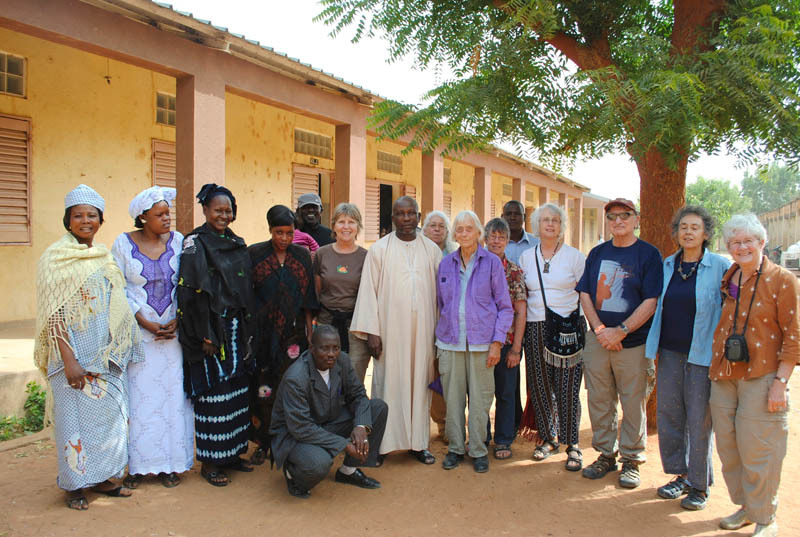 SOUTHEASTERN SENEGAL: This past January 2014, Behind the Scenes travelers brought several duffle bags of school supplies to give out to a special school. Our nice driver, Idrissa (for whom education is very important), knew of a school that needed supplies. So one morning we stopped and met the Principal, Mr. Sy, at a school along our route. He showed us his small office and two bare-walled classrooms, plus a third temporary bamboo-walled space where students were working on French grammar on the blackboard. We gave Mr. Sy the many pens, pencils, notebooks, and so forth that people had brought to donate. Of course he was very happy, and very touched by their generosity. He impressed us all with his sincerity and devotion to his students. Then we went around back, where a 5-foot length of light bamboo fencing had been propped up in a semi-circle, as a shelter for the girls “bathroom.” Mr. Sy confided that something they really needed was a decent bathroom for the girls so they could have privacy and not be surprised or teased by boys walking by. As we walked back to the van, we all felt a bit stunned at the conditions. But Ruth Altman of New York declared that she was going to do something about the lack of a bathroom for the girls! So over the next few months, many email and phone conversations resulted in Ruth’s sending money in two installments for the project. It consisted of two bathrooms each for girls and boys. Barou kept in close contact with Mr. Sy, as a “project manager” from afar, and Ruth had frequent updates about the progress of the project — until yesterday when we received these photos of finished bathrooms! One person can make such a difference. Bravo Ruth! Barou talks to 3rd and 4th graders about the importance of doing well in school – in French, then in their first language, Bambara. 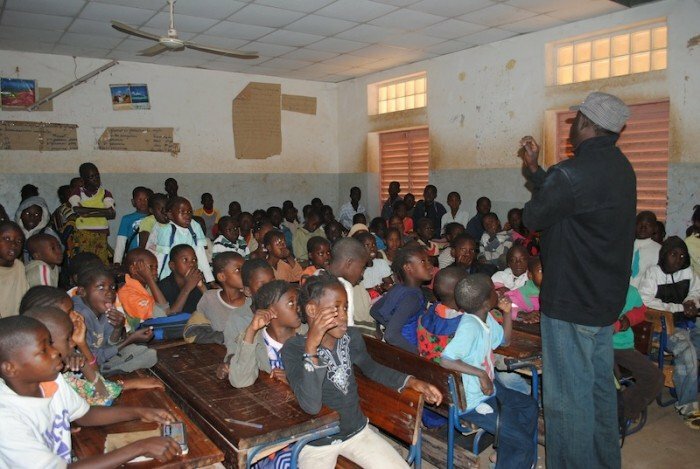 SEGOU, MALI: Another school we visit is Barou’s old elementary school in his hometown of Ségou. The situation there has changed drastically from when he actually learned the 3 Rs; he was shocked to find that his 8-year old nephew has 168 other students in his chaotic classroom, with one teacher and her assistant, right. At this school, the last two BTSA groups to visit Mali with us donated big bags of pens and pencils, chalk, erasers and composition books. We are anxious to return to Mali with groups and continue the BTSA help projects as soon as it becomes more peaceful. 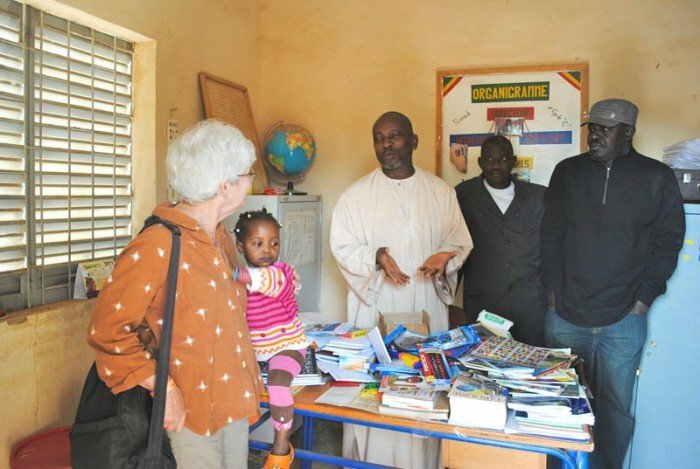 Director in Segou receives BTSA travelers’ donations to the school. Our niece Katya holds on tight to new-found friend, Anne Duffey. Staff of Ségou elementary school and BTSA travelers pose next to the classrooms. There is no play equipment whatsoever in the yard. According to travel expert Jeff Greenwald’s “Ethical Traveler” guidelines, we make a point of not handing out pens and pencils and other items to kids in the street, — because among other problems, this can create a wild scramble, with fistfights among the would-be recipients. Donated school supplies are always handed directly to the school director or teacher in charge, because they know how to distribute the items fairly. Teachers sometimes save special sets of pens or fancy pencils and notebooks for class prizes. 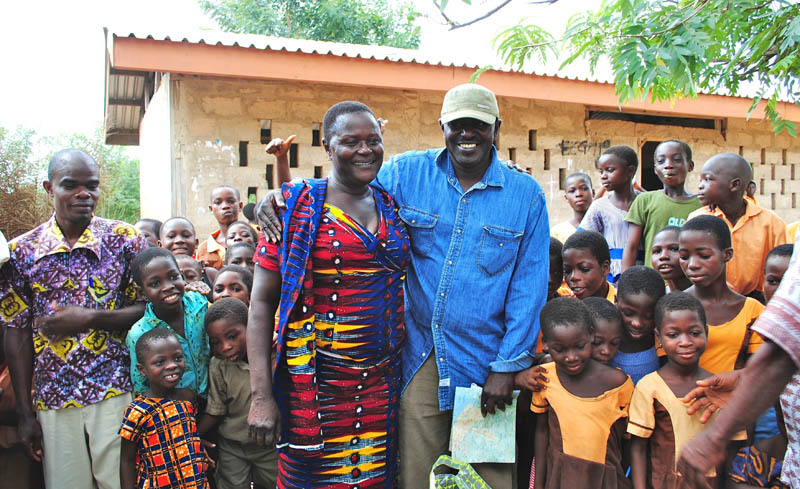 Barou, with Augustine, the principal, who is receiving the BTSA donations for her students. Students with BTSA travelers and BTSA driver Robert, second from left; Ghana. VOLTA REGION, GHANA: In Ghana, there is another little school that we have become very attached to, in the south-eastern area called Volta Region, close to the Togolese border. It’s also a primary (elementary) school with a fanatically devoted principal named Augustine. 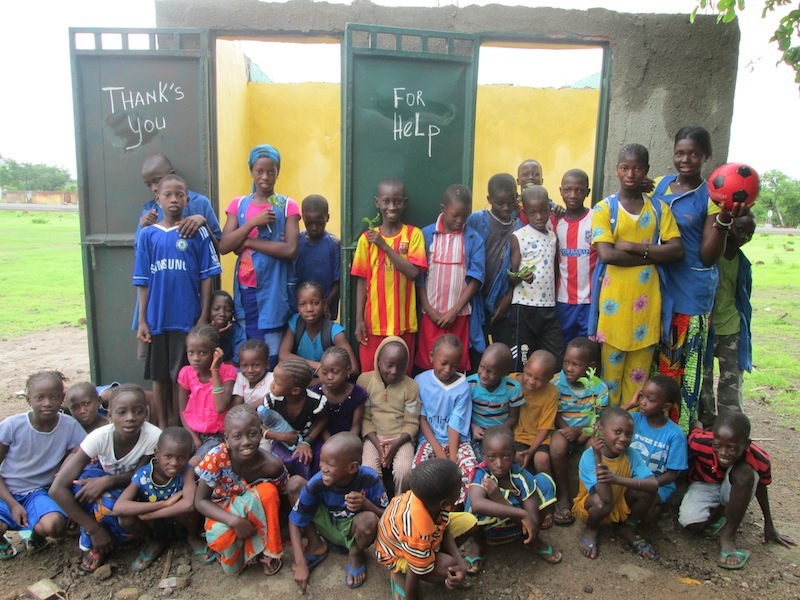 Classrooms are not as crowded here as in the Malian schools, but they have equally bare walls. The children here wear uniforms and have shining faces because Augustine has good communication and rapport with the parents and she insists that the students come to school with clean faces and clean uniforms. 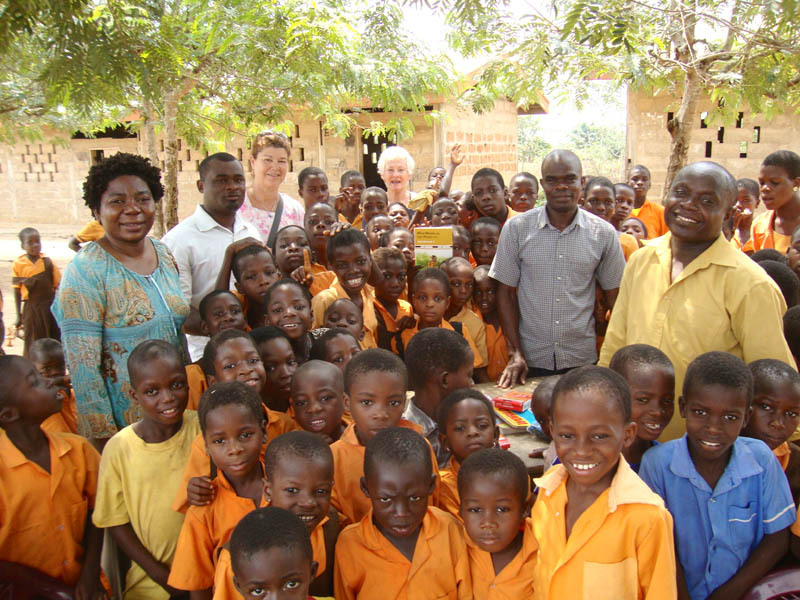 Over the past few years, many BTSA group members have brought rulers, colored chalk, paper pads, and so forth, even children’s books because English is spoken in Ghana. Tedi Siminowsky even cajoled her Berkeley, CA, book club into donating a whole duffle bag of supplies for this school! Tedi, at right-center, and BTSA group, being thanked by Augustine and other teachers. Sometimes BTSA help projects take the form of medical aid. Tedi also brought a large bag of medical supplies for the Bandiagara Hospital Clinic when she traveled to Mali with us a few years earlier. I called a physician friend in Bamako to be sure the items would be useful in a dusty, rural hospital before she departed with them. He said none of the items needed high-tech connections to be used properly. Barou was nervous about the supplies being sold by one of the hospital staff, so he called in the City Mayor and a local newspaper reporter to witness the hand-off of thousands of dollars of pediatric medical supplies. He made sure the officials knew the items were being DONATED and were to be distributed free when needed. Apparently BTSA was in the local paper, but we didn’t get a copy of the news. Behind the Scenes Adventures has asked travelers to consider bringing things to give away for over two decades — and they have all been so generous! 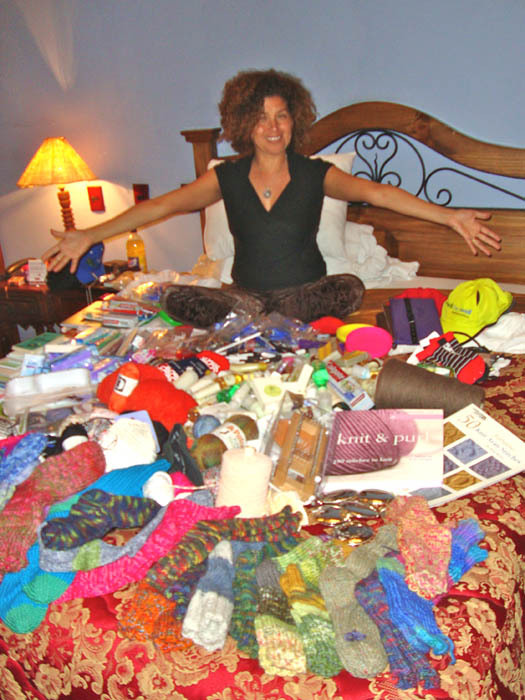 Claudia Avila, overjoyed at all the goodies donated for the remote Andean villages; Beverly’s socks are in the foreground. Knitters traveling to Peru and Bolivia bring extra yarn and needles for knitters. They also bring the little hotel bottles of shampoo and soaps so prized by the women living in the Andean highlands. Beverly Johnson is the “Champion of Andean Giving;” one year she knit 27 colorful sweaters for toddlers in the mountain villages. Later she knit 36 pairs of warm socks for village kids in the Cuzco area. My old friend in Cuzco, Peru, Nilda Callañaupa who travels to the knitting villages with us, had to devise a lottery system for the sweaters and socks because everyone wanted them! We hope that if you decide to travel with Behind the Scenes Adventures, you’ll consider bringing items to donate to participate in BTSA help projects. Ask what is appropriate and most needed in specific areas. Every little bit can help, and you have been most generous so far!